For those still seeking the thrill of late season ice, opportunities are still strong. Grand Traverse Bays are still boasting thick ice in the 15-16 inch range, but with the cold temps at night the past few days, more ice is not only possible, but probable. This means that anglers seeking to fish for lake trout or whitefish will still have their opportunities to land these excellent tasting fish. Depending on the fish’s moods, they can be found anywhere from 85 feet all the way down to 150 feet for the whitefish. The standard jigging baits work well for the lakers like Krocodile spoons, Sandkickers or Jonah Jigs. The same lineup for lakers will also take their share of whitefish, although they tend to prefer slightly smaller spoons. Swedish Pimples are another dynamite option for these fish, and bites are unmistakeable when they are on the bite. Inland lake anglers are still taking plenty of perch and smelt. Walleyes on the Great Lakes remain open, so they are still able to be targeted. Only inland lakes and rivers are closed for walleye fishing. The yellow perch have been above average in size on select inland lakes, and they have been willing participants for many who have located the schools of these tasty favorites. Smelt have been biting just at sunset and dusk, into the first hour of darkness. While smelt themselves aren’t a huge species of fish, they are loads of fun through the ice, and are just as good on a plate! Grand Traverse Bays are still solidly covered in ice, much of it as thick as 17 or 18 inches in many places. For mid March, this is highly unusual, as we were still making ice just a couple of nights ago! The many ice anglers that have ventured out onto the Bays have been mostly pleased with the results, with many lake trout, whitefish and burbot being caught. 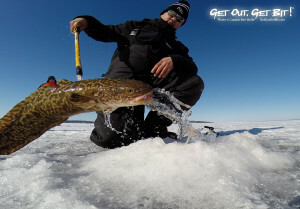 Burbot are on the very tail end of their spawn, and many anglers have taken advantage of this excellent table fare’s willingness to bite. Anglers have also sought yellow perch with nice size perch being reported on East Bay. The bite in recent days has fluctuated greatly, with the full moon likely playing a large role in many angler’s success or frustrations. As the moon phase wanes, expect fishing for lake trout and whitefish to pick up a bit. Inland lakes continue to be fishable, and weekend traffic has been steady. Although numbers of ice anglers on inland lakes might be down overall, but perhaps this is due to such good ice conditions on the Bays in Traverse City. The snow is gone off of the ice, leaving solid smooth sheets that resemble a skating rink. While the ice is still thick, care should be taken when driving snowmobiles on the ice, as the lack of snow can wreak havoc on a snowmobile’s hyfax and track without lubrication, as one unlucky group of anglers found out recently. Fishing has been spotty of late, with the smelt bite getting harder and harder. Many smelt that were caught were during non-traditional times, it seems. Panfish are still readily taken, when an angler can land on a nice school. Late season pike fishing is starting to heat up, and the walleyes are still plentiful, though not always willing to bite until just before sunset. Anglers seeking to fish northern Michigan waters from a boat may have to wait a while. Soft water anglers can’t wait to get back in their boats, but with so much ice covering Lake Michigan, the Grand Traverse Bays and area inland lakes, it could be a while before that happens! Spring fishing will be pushed back a bit, but expect the fish to be hungry and willing. Ice Fishing Report: Current ice conditions are still safe for the most part, with many vehicles being driven out onto the ice still. This past weekend saw dozens of pickups, SUVs and even a convertible out on Grand Traverse Bays, where ice was about 16 inches thick. While the ice is still mostly safe, the warm temperatures early in the week made for some softer, slushy conditions, but there was still over a foot of drill-able ice on the Bays. The current cold snap should have the slush freeze back over, as there is little to no snow on top of the Bays. Where there is snow covering the ice, expect slushy traction. With high winds expected, as always, caution should be taken when traveling or fishing near any pressure cracks. Inland lake ice is thicker than is the ice on the Bays, but this recent sunny, warm weather has the snow atop the ice somewhat slushy. The mid-week cold temps may not freeze the slush where there is snow insulating it from above. Snowmobiles and ATVs are the normal vehicles seen out on the inland lakes, but this slush could change that quickly. As always, a conservative approach should be taken when venturing out onto the ice. Fishing has been very good as of late. The whitefish bite out on Grand Traverse Bay has been a little hit or miss, but when they can be found, the bite can last most of the day. Lake trout and burbot action has been hot through the ice as of late. Burbot are spawning, and it has been fun cashing in on the hot bite for this excellent eating fish. Rumors are being heard that there has been a good yellow perch bite in parts of the bay, with big perch being caught. Anglers scoring these jumbos are pretty tight-lipped about the exact locations, but the normal spots are likely the best bets. This past weekend was windy, but with a shanty to help break up the wind, the fishing was excellent for many anglers, with almost anything dropped below the ice. Fishing has been good on several of the inland lakes for late-ice walleyes. The typical tip-up and jigging setups have been the the keys to these table-side favorites. Yellow perch have been a bit tougher to come by in good numbers, but every day is different, and as the schools move through the break lines, it’s possible to score well with a variety of baits. Whitefish and lake trout have been a bit more stingy as of late, but action is expected to heat up again before ice-out. Smelt on several of the inland lakes known for their smelt fishing like Crystal Lake has been good. Anglers have been able to catch quite a few of these fan favorites.